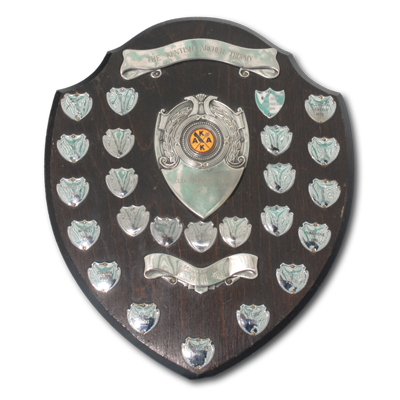 Wooden Shield with polished metal boss, scrolls and mini-shields. Kent club junior recurve freestyle team with the highest combined score. Open only to juniors, shooting the appropriate Bristol round for their gender and age group with the recurve freestyle bow. A team consists of three archers from the same club. Presented by R. S. Bloodworth.